[PDF] Modern Philosophy: The Seventeenth And Eighteenth Centuries | Free eBooks Download - EBOOKEE! Description: Modern Philosophy is an exploration of the ideas of six major thinkers from Descartes to Hume. It takes a fresh and engaging look at the common themes that dominate this period, as well as examining the differences in the work of the six philosophers. 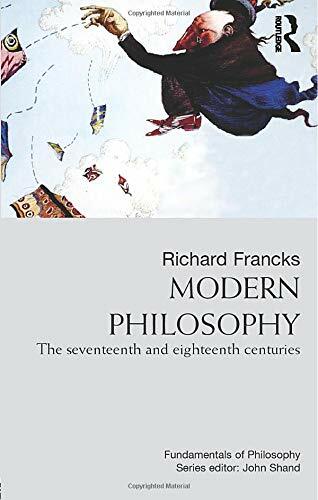 Through vivid and witty prose, Richard Francks skilfully presents ideas that have informed the development of philosophy as we know it, and which present a challenge to beliefs and attitudes that most of us now share. In this work we find the source of modern philosophical inquiry - questions such as the existence of God, the Mind and Body problem, the idea of self, and the existence of the world had their birth in these texts - as well as broader questions about political and social philosophy. Thinkers discussed: Rene Descartes Baruch Spinoza Gottfried Willhelm Leibniz John Locke George Berkeley David Hume This will be ideal for anybody coming to the ideas of these philosophers for the first time. No comments for "[PDF] Modern Philosophy: The Seventeenth And Eighteenth Centuries".